Can the long-form census be saved? I fear it cannot. I fear that the announcement by Industry Minister Tony Clement to scrap the mandatory long-form census in favour of a voluntary survey has already damaged the future of the census beyond repair. I fear that the minister has already galvanized those who support his point of view such that any return to a mandatory census will only see more inaccurate answers than ever before. Before the issue exploded in ink and phosphor, how many people actually thought to list their religion as Jedi Knight? In 2001 that was 21,000 people, or approximately 0.0035% of the total respondents covered by the long-form census — well within the margin of error for most statistic reports. But what about now? Who wants to take bets that the rank of Jedi Knights will see a significant increase in their number if the government is forced to reverse its decision? This is my biggest concern as well. Even if the decision were reversed now, the government’s rhetoric will have given more people the view that the census is coercive, as opposed to a civic duty. With respect to the census, the relationship of Canadians with the census will be fundamentally changed. I hope we’re wrong, but that’s my fear too. There’s some great open government and open data momentum in Canada right now, with a few websites coming online in recent days. There’s the wonderful??openparliament.ca,? ?and datadotgc.ca??is? ?expected soon. See David Eaves article in the Globe and Mail? ?on this, or his blog post. 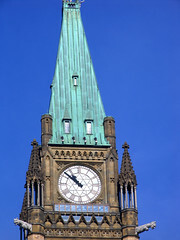 And let’s not forget one of the first Canadian websites in this area, MyCelium, which indexes video of question period. On the government side, this week PMO spokesman Guy Giorno said (link to committee evidence coming soon) that freedom of information is the oxygen of democracy, although the Information Commissioner’s report gave the government a failing grade on their access to information practices. Tonight, David Eaves will be on The Agenda to talk about open government.? ?And there’s word that a major opengov unconference is coming to Ottawa soon (stay tuned for more about that). It’s great to see this momentum gathering. But I’m concerned about the lack of an established, funded, independent body in Canada to coordinate government transparency initiatives from outside of government. In the US, while the government runs data.gov, the independent organization Sunlight Labs develops tools and projects focused on open government. In the UK, there are government initiatives for opengov, but the independent group mySociety? ?similarly develops tools and runs projects focusing on government transparency and citizen enagegement. In Canada, we have this wonderful assortment of websites, all developed independently, but as a result there is no coordinated strategy in their development or centralized API or access to the sites. It’s great that individual Canadians are taking the initiative to develop these sites, and absorbing the cost of hosting them, and I wouldn’t want to create barriers to that. But at the same time, it would be more efficient to coordinate what is needed and work together to develop (and in some cases adapt) the best possible tools for government transparency and open data. Unfortunately, there is currently no organization in Canada in a position to take on this task. The closest thing we have, Visible Government, is a homegrown organization modeled on Sunlight Labs and mySociety, but has struggled to secure the funding necessary for them to meet the challenge. It is a great organization with the kind of vision needed for the job, but the lack of funding may make it impossible for VG to do their work on the scale Canadians really need.?? [Full disclosure: I was formerly on the board of VG]. It saddens me to think that just as momentum is growing in this area, an area that Visible Government pioneered in Canada, one of the only independent organizations at the centre of the movement may fail because of lack of funds. Michael Geist reports on an important recent decision of the Canadian Patent Appeal Board (CPAB) regarding business method patents. These are patents that companies started collecting in the United States in the 1990s but which have not been embraced as enthusiastically in Canada. 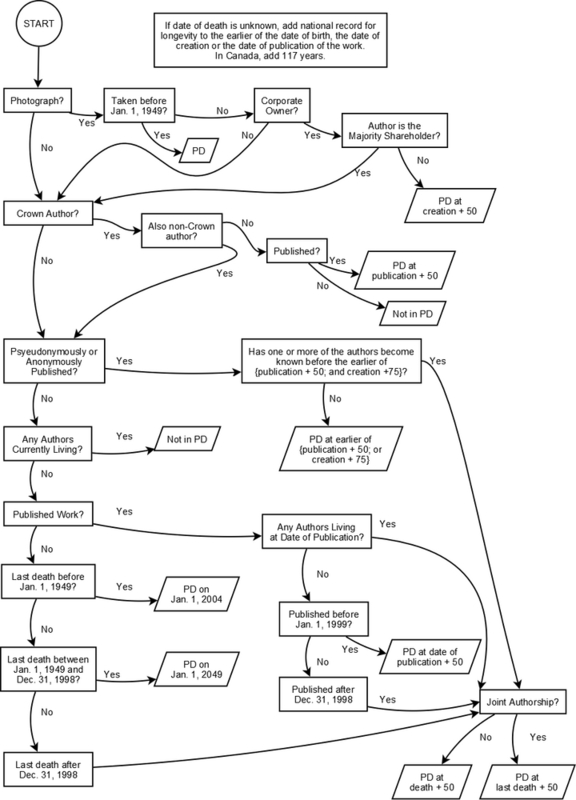 The most notorious business method is probably Amazon.com’s patent on the method of processing a customer’s online order in one click. The Canadian Radio-television and Telecommunications Commission (the CRTC) today released a very important decision reviewing their original New Media decision of 1999. In the 2009 review of that decision, the CRTC has essentially extended their policy of not regulating new media. OTTAWA-GATINEAU —The Canadian Radio-television and Telecommunications Commission (CRTC) today announced that, after a careful examination and a full process, it will maintain its approach for broadcasting content distributed over the Internet and through mobile devices. The Commission will continue to exempt new media broadcasting services from its regulation and monitor trends as they evolve. Read the full release and decision for details. Basically, the Commission was not convinced in the hearing process that regulation was needed in this sector. But there will be some changes. For one, it will be five years, not another 10, before they review this again. And they are asking the Federal Court of Appeal to clarify whether internet service providers are subject to the Broadcasting Act if they provide access to traditional broadcasting content. But most intriguing is the CRTC’s endorsement of the National Film Board’s call for a national digital strategy, as some countries already have in place. New media itself has evolved tremendously since the CRTC first considered it 10 years ago, and is likely to change even more dramatically before they reconsider this decision in 2014. Let’s make sure there is a national policy in place before then to ensure a safe market for innovative media developers. 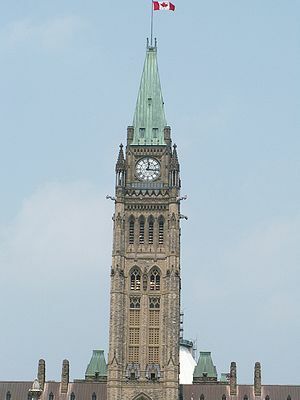 On June 11, 2009, I will be leading a “Roundtable on E-Democracy” on Parliament Hill in Ottawa for parliamentarians . At that meeting, I want to present and discuss the ideas that I heard people talking about at ChangeCamp Ottawa. But instead of just writing an outline for a presentation/discussion based on the topics that I think are important in terms of citizen engagement, I thought I would use some of the very technology that has sparked an interest in citizen participation, like EtherPad.com. So if you’re interested in how changing technologies, trends, behaviours, expectations and standards present challenges and solutions for citizen engagement with government in Canada, please head over to this very easy-to-use page at Etherpad.com and contribute your thoughts. And please pass on the link — the more people who contribute, the more I can bring your thoughts to decision makers on the Hill. When you get there, please feel free to add to the list of topics, take topics out, move them around, restructure the list, or even suggest formats for delivering the information to the intended audience. If you want to, you can do it anonymously. If you leave me your name or handle, I’ll give you credit at the Roundtable. Once again, you can find the page to edit right here. Michael Geist has a new service online today called CAIRS.info which resurrects the government’s ATIP request tracking service, CAIRS. And how does Geist get the content for the site? How does he find out what ATIP requests government departments are handling? I can’t be sure, but it looks like he makes ATIP requests to find out! 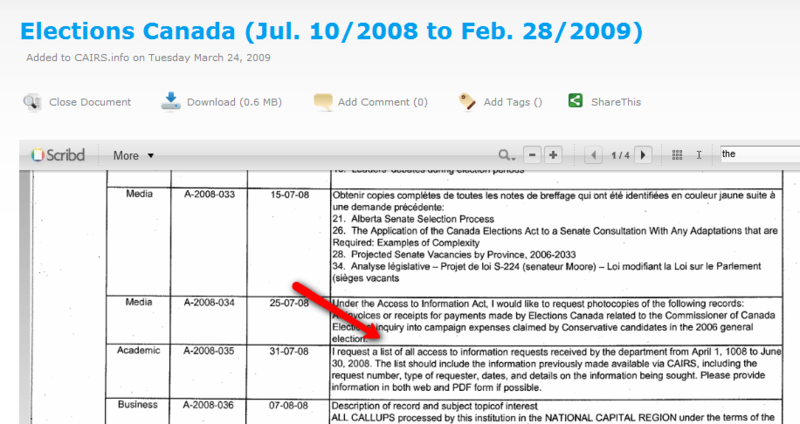 In this image from CAIRS.info, from here, we see Elections Canada reporting that one of the ATIP requests they got in July 2008 was a request for a list of all ATIP requests received. I enjoy the recursiveness of this.